I share a love-hate relationship with YOUTUBE. On lonely nights, I snuggle up in bed with YouTube on my fingertips. On busy days, YOUTUBE keeps enticing me to watch something on it. I can’t even write a freaking blog post because every now and then I keep getting distracted. Sometimes it’s Ellen dancing away and sometimes it’s Nigella and her kitchen. I really need to get my priorities right. With thanksgiving out of the way, it is time to plan for Christmas!! One of my favorite times of the year! It is just so pretty everywhere! Every year right after my annual Christmas party with the cousins, I end up thinking as to what I am going to prepare for our next year Christmas party. It feels like it was just 2 months ago, I was wrapping Christmas presents and it IS going to be Christmas again? I am not complaining even if Christmas were to come every time I blinked my eyes, provided that an extra wrinkle does not bulge on my face with every passing Christmas. Truthfully, it feels unreal, though I suppose that’s the case every year. I spend two months preparing for Christmas and it still comes as a surprise when it finally arrives. Does that make me nerd? Wonton Noodle Soup, I love thee to the depth and breadth and height. ♥ I am tempted to employ a bunch of words to describe this Wonton Noodle Soup but I won’t despite the fact that this bowl of noodles is cozy, delicious, warm, enjoyable, satisfying and appetizing. Wontons are basically dumplings that originate from the Chinese cuisine. It can either be steamed, fried or boiled. It can be eaten on its own or along with some noodles which is known as Wonton noodles. 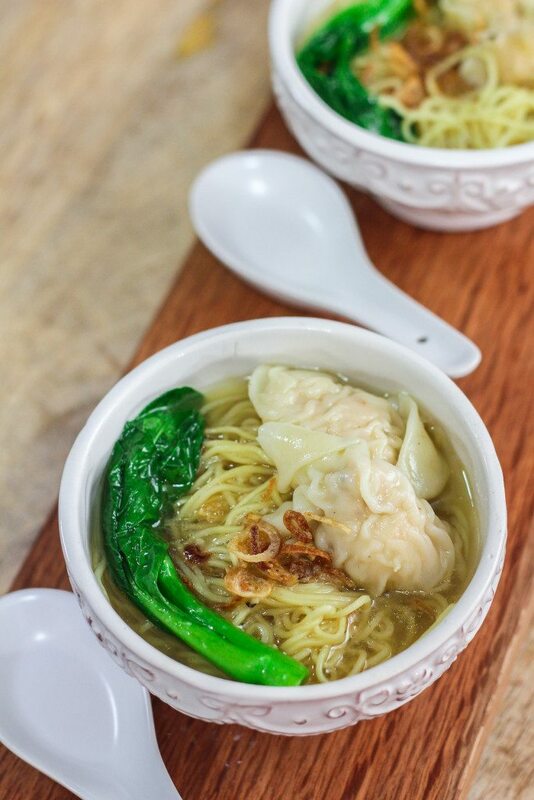 Although there are many variations of wonton noodles, the most popular one would be some egg noodles tossed in a sauce and topped with wonton. I have attempted something similar here. 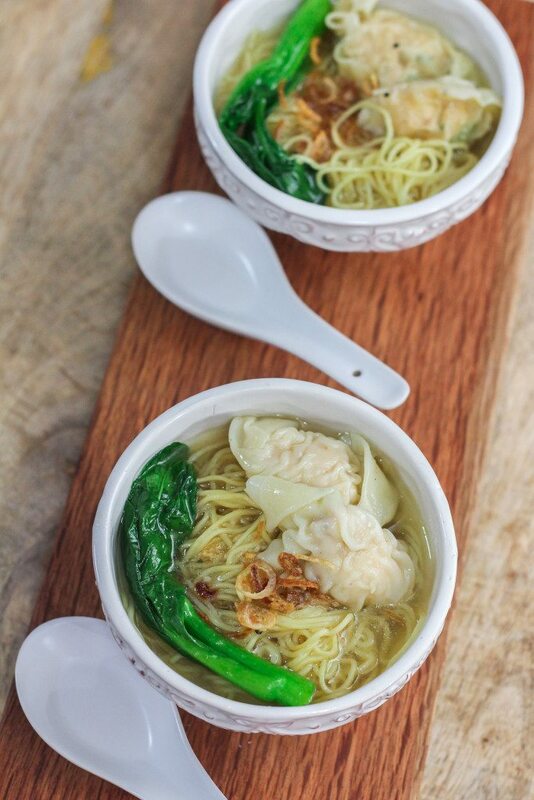 Another variation would be egg noodles served with a hot broth, garnished with leafy vegetables and wonton dumplings. This is the one we would be making today. 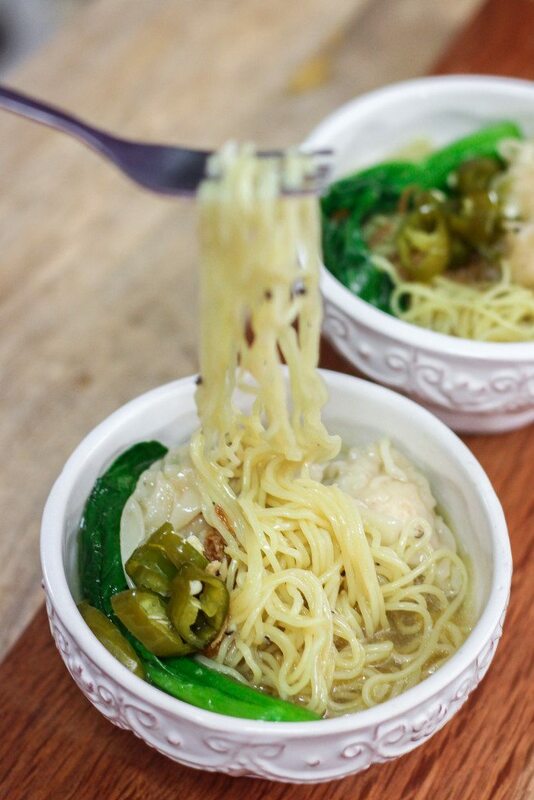 Although it is optional, but serving wonton noodles with pickled chilies just brings the noodles 1 notch up and it is SO easy to make the pickled chilies so I would suggest that you go for this. Wontons are really simple to prepare. You would basically make the filling first, which in this instance I am using prawn and chicken meat. 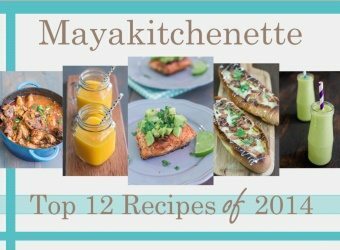 You can use all chicken, all prawn, fish or any other ingredients you prefer. 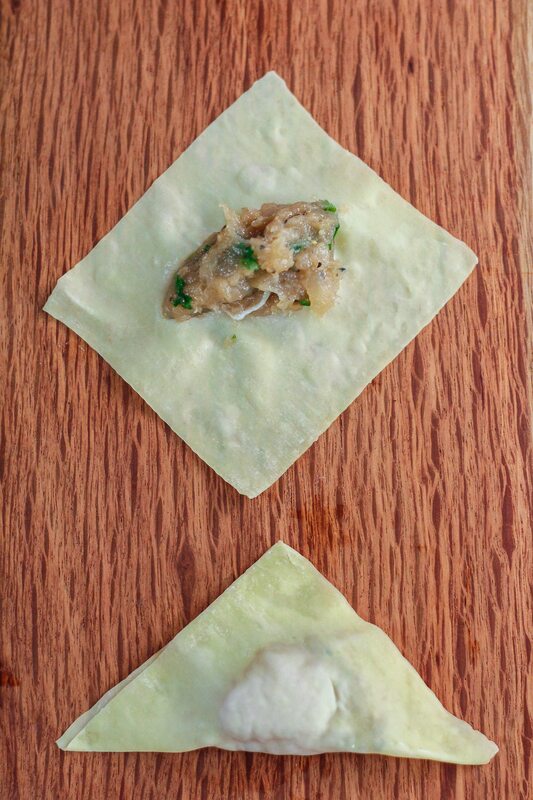 Making dumplings out of wonton wrappers might seem daunting for some of you, but trust me, although there are many ways to fold a wonton, you can go with the easiest and most basic of wonton just like this one below. Put a teaspoon of filling in the center of the wonton wrap. Bring 2 sides of the wonton wrapper together to make a triangle. It is the holiday period and this is the perfect recipe to make with your kids. Gather them in your kitchen. If you have only two, nice family planning I have to say and if you have 7 of them, well you have got to make a WHOLE lot of wonton lady! Then again, you would be having 7 extra pairs of hands to help you. It is a simple project that they would love. Do you know that Wonton wrappers can be used to make a whole lot of other stuff? You can fill a wonton wrapper with Nutella, apple pie filling, cream cheese and tons more. Simple desserts in a jiffy. You can also make tacos with wonton wrappers and oh lasagna too! Perhaps one of these days, I would do a post on wonton lasagna for you guys. It’s really quite scrumptious. Wontons are a great make ahead. In fact, they freeze really well too! Firstly, you just have to lay the wonton in a single layer so that they do not stick to each other. Once they are frozen, you can just chuck them in a freezer bag. When you are ready to use them, just place them in the boiling broth. Do not defrost them prior to cooking as they would end up sticking to each other. For me, this Wonton Noodle Soup is the perfect weekend treat. Slurping away to these noodles is what weekends should be made of! Place the sliced green chilli in a bowl and pour 2 cups of hot water over them. Leave it for 10 minutes and strain. Discard the water. In a bowl, mix green chillies, salt, vinegar and sugar. Keep this aside. In a large bowl, combine the chicken, prawn, soy sauce, oyster sauce, sugar and sesame oil. Use a blender or food processor and process this till fine. Alternatively, you can purchase minced chicken and chopped up the prawns, if you do not have a food processor. Put a teaspoon of filling in the middle of a wonton wrapper, brush with some water on all edges. Fold over to form a triangle, press to secure edges. Place wontons on a plate and cover loosely with plastic wrap to prevent it from drying. Repeat with the remaining. In a large pot, add 1 tablespoon of oil and saute garlic for 30 seconds. Add the chicken broth and bring to a soft boil. Add the wontons and cook them till the wontons start floating. Remove the wonton and distribute amongst the bowls. Once the wontons are done, add ½ cup of water to the broth and bring it to a soft boil again. Cook the noodles in the pot of broth according to the package instructions. Add the bok choy to the pot and cook this for about 1 minute. Ladle noodles and bok choy to bowls. At this point, add some pepper to the broth and some salt if required. If the broth has evaporated significantly, you can add some water to the broth. Lastly, drizzle some sesame oil to the broth and ladle the broth over the noodles and wonton. Garnish with fried shallots and pickled green chillies.